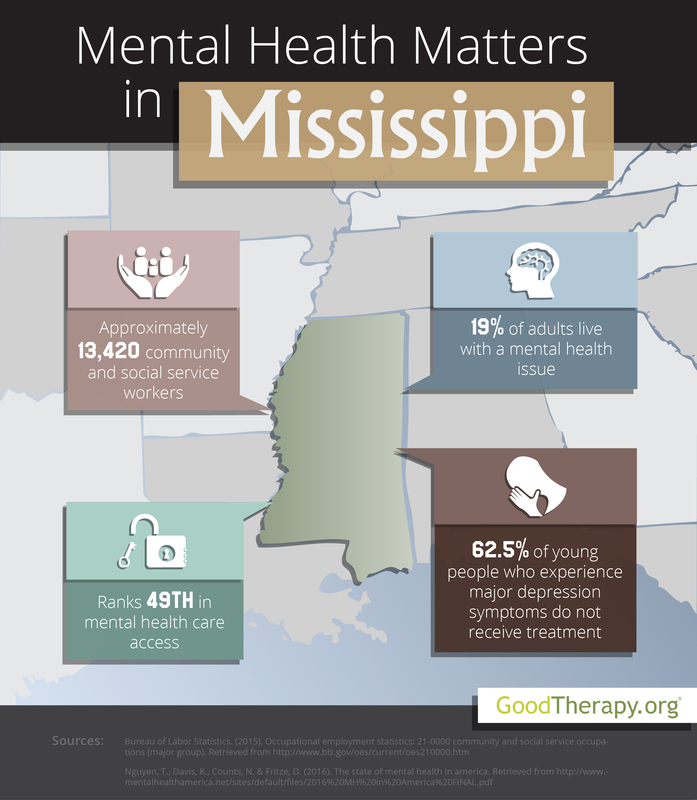 Find a therapist in Mississippi with GoodTherapy.org. The United States Census Bureau asserts nearly 3 million people lived in the state of Mississippi in 2015. The population was comprised of 59.7% white residents, 37.5% black residents, 1% Asian residents, and 0.6% American Indian and Native Alaskan residents. Approximately 24.4% of the population was under 18 years old, while 14.3% was 65 years or older. Females made up 51.4% of the total population. According to the Bureau of Labor Statistics, occupations specializing in social service and community assistance programs in Mississippi are currently filled with 13,420 residents who earn an average of $38,750 each year. Occupations within these fields may include working at depression treatment centers, hospitals, clinics, substance abuse rehabilitation centers, correctional facilities, schools, foster care facilities, and residential treatment centers. Each year, Mental Health America (MHA) publishes a nationwide survey highlighting current mental health standards across the country. In 2016, Mississippi was given an overall rank of 35th for mental health conditions and services—out of all 50 states in the U.S. and the District of Columbia. The state was 46th in adult ranking, 24th in youth ranking, 11th in prevalence ranking, and 49th in access to care, indicating a low rate of people with mental health conditions being able to receive any sort of mental health treatment. Researchers and analysts from Mental Health America contend that Mississippi’s access to mental and behavioral health services correlates with social factors such as low rates of high school graduation, low rates of high school graduation for students with disabilities, high rates of unemployment, high rates of obesity, and high rates of poverty in the state. Reports from therapists in Mississippi as well as data from the 2016 MHA survey reveal about 19% of adults in the state experience mental health issues. Mississippi was ranked 30th for this measure. However, with about 3.9% of adults experiencing serious thoughts suicide, and a relatively low 8% of adults displaying drug or alcohol dependence, the state received higher rankings of 18th and 7th for these respective measures. Mississippi received considerably low rankings in several categories used to gauge mental health care accessibility. According to Mental Health America, Mississippi was 47th for adults with mental health issues who do not undergo treatment; 47th for adults with mental health issues who reported unmet need; 44th for adults with mental health issues who do not have insurance coverage; 51st for adults with a disability who could not afford to see a doctor; 39th for children with insurance that did not provide coverage for behavioral and mental health issues; and 46th in mental health workforce availability. At present, there is a ratio of 887 residents to 1 therapist in Mississippi.